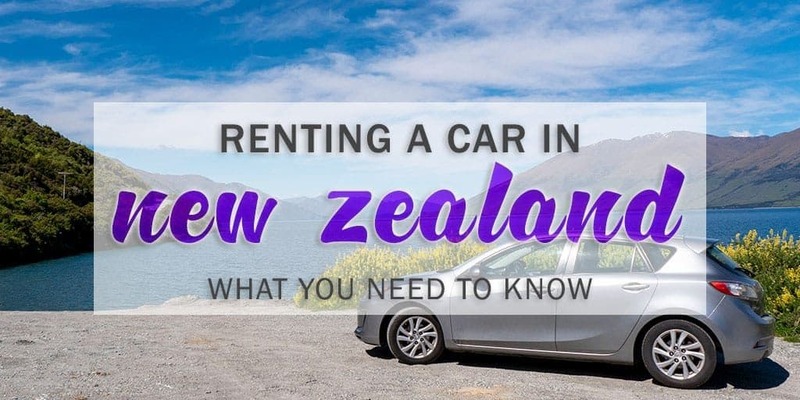 Here’s what you need to know when you rent a car in New Zealand. When I think about New Zealand, the incredible natural scenery of the country immediately comes to mind. Whether it’s the mountains of the South Island or the geothermal regions of the North Island, it’s somewhere I wanted to travel around as much as possible, no matter how remote the location. The best way to see New Zealand is to travel by car. 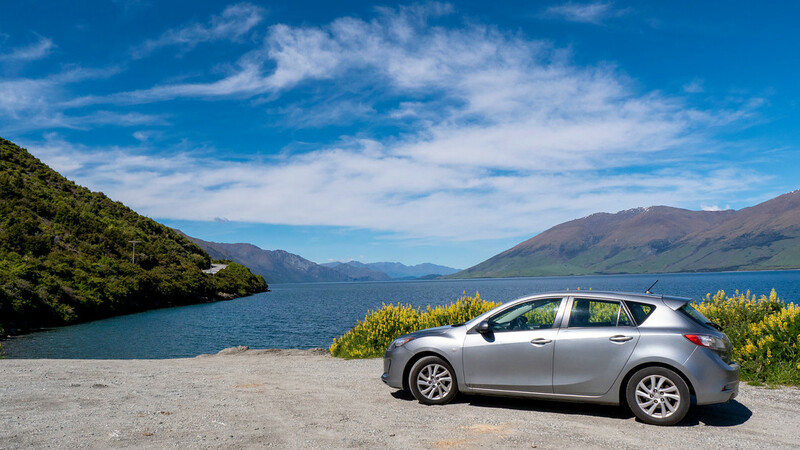 When you rent a car in New Zealand, you have full control over your own journey. We chose to drive from Queenstown to Auckland, exploring the west coast of the South Island and taking the ferry up to the North Island. 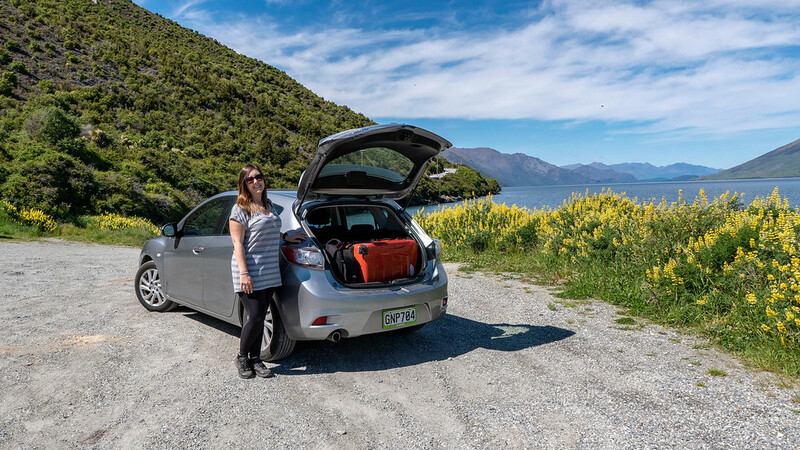 Before you embark on your New Zealand road trip adventures, here are some important tips to know when you rent a car in New Zealand. 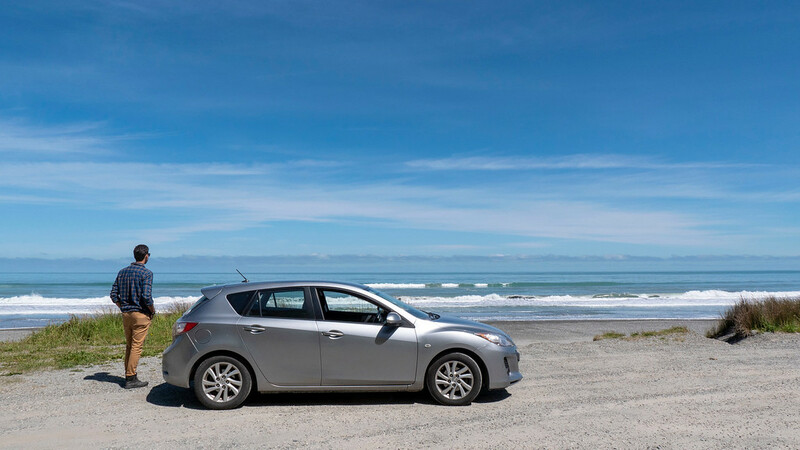 With so many companies and options, it’s hard to know which one is the best car rental in New Zealand. Thankfully, there are some ways to narrow down your choices to make the best selection. It’s always best to compare the prices between companies for a cheap car rental in New Zealand. 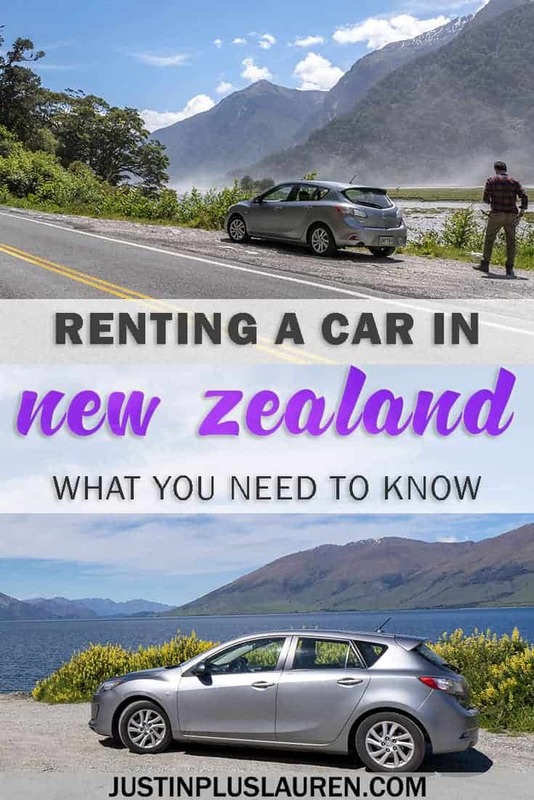 Make sure that when you rent a car in New Zealand that the automobile includes everything that you require for your trip. It’s popular to choose either a car or a camper van in New Zealand. Unless you intend on camping around the country or sleeping in your van, I recommend choosing a small car because you will save a lot of money on gas. We picked a small car with an automatic transmission because neither of us know how to drive a car with manual transmission (don’t laugh, it’s true!). Justin and I also made sure that the trunk had enough space for two suitcases and two backpacks, as that’s the amount of luggage that we brought with us. Furthermore, if you’re used to driving a small car, you might want to rent a small car. 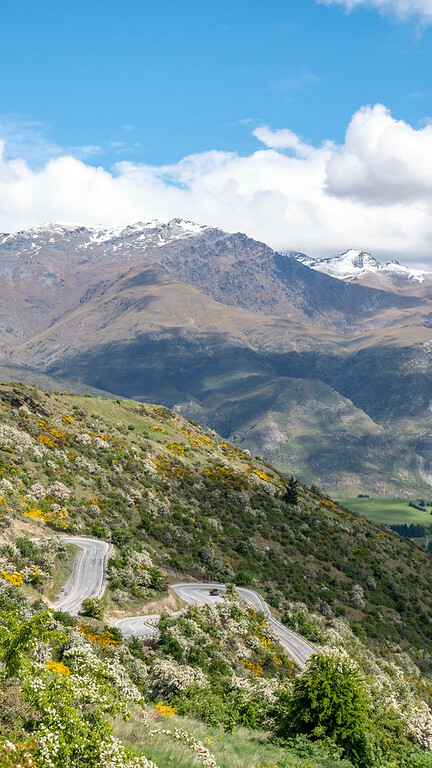 After all, some of the roads (especially in the South Island) are quite narrow and winding through the mountains. If you’re hiring a car rental in New Zealand, book it in advance as much as possible. If you know your travel dates, you may as well book it right now. The prices will only grow more expensive over time, especially if you’re traveling during the high season (December to February). New Zealand car rental suppliers will start to run out of vehicles, so you don’t want to end up without one (or paying a huge premium to get one). If you can book the car rental several months ahead of time, save yourself the headache and do it. While the roads in New Zealand are in great shape, you still need to exercise some caution. There are gravel roads in New Zealand, which can lead to stone chips and cracks in the windshield. Even if you’re the most careful driver, you can still end up damaging the car in some form. I usually recommend purchasing additional insurance for my own peace of mind on vacation. I’d rather not have to worry about every little mark that might end up on the car at the end of the trip. New Zealand is one of the safest countries we’ve ever visited. However, theft still happens, like it does everywhere. Make sure to properly conceal your luggage or valuables in the car when you park it somewhere to go wandering. If it’s possible to leave your valuables locked safely in your hotel, that’s the best option. I realize that isn’t always possible when you’re driving from place to place. Be sure to lock your vehicle and keep your valuables out of sight. Planning the direction of your road trip and the dates might help you save some cash. In some situations, you might save money by driving from the South Island to the North Island. Most people start in Auckland and make their way down to Queenstown. Therefore, companies end up with an excessive amount of vehicles in Queenstown and a shortage in Auckland. If you choose to drive from Queenstown to Auckland, you might have a better choice of cars and save a little bit of money. Secondly, you’ll likely pay more to rent a car if you visit New Zealand during high season (December to February). The cheapest times to rent a car are between May and September. We went to New Zealand in November, part of their shoulder season and the beginning of a busier time for tourists. Also, the longer you rent your car, the better. If you rent the car for an extended period of time, the price will drop per day. While many of the road rules are basic common sense (for example, following the speed limit), there are some that might be new to you. It’s a good idea to have an understanding of the road rules of New Zealand. There will be signs everywhere you travel, and it’s a good idea to make sure you know what these signs and symbols mean. For those living in North America and other places where you regularly drive on the right, you’ll have to get used to driving on the left. This always takes a little getting used to for us because we’re from Canada. Don’t let yourself get too comfortable and drift back into your habits of driving on the right. Thankfully, Justin did most of the driving for our trip and he managed to always keep to the left. There are lots of bridges that are only one lane wide in New Zealand. In this case, only one vehicle can drive across it at a time. When two vehicles approach from opposite sides, there are signs that designate which vehicle can pass first. If you have the larger arrow on the sign, it means that you have the right of way. If you have the smaller arrow, you must let the opposing vehicle pass first. It’s all about being cautious, courteous, and following the rules. It’s always a good idea to keep your eye on the fuel gauge as you don’t want to run out of gas. In some areas, there might not be very many gas stations. We found this was the case while driving the Haast Pass and some spaces on the west coast of the South Island. Make sure you fuel up before you head out, even if it means topping your gas tank up. It’s better to be safe than sorry on your New Zealand road trip. When you rent a car in New Zealand, it’s most important that you stay safe. Following the rules of the road is one way to stay safe. There are a few other practical things to know about driving in New Zealand that will be helpful to keep safe on the road. Many of the speed limits, even around the winding mountain passes, are between 80km and 100km/hour. We found that many of the speed limits were far too fast for us. It was best to be cautious around the twisting roads that were completely unfamiliar to us. However, many of the people zipping around these turns are local citizens who are very familiar with the roads. They’ll be driving a lot faster than you. It’s a good idea for you to take it slow. However, if a big line of cars start to pile up behind you, it’s courteous to pull over and let these cars pass. It’s actually a law that you must let cars pass you if there are 4 or more cars behind you. Thankfully, there are lots of roads with secondary lanes that open up to allow cars to pass you safely. There are also places where you can pull over to the side to let other vehicles pass you. Do not stop randomly in the middle of the road if you see a beautiful view and want to take a picture. It not only breaks the law, but it’s incredibly dangerous. There are so many designated small parking lots and places to pull over to the side of the road to admire the view. 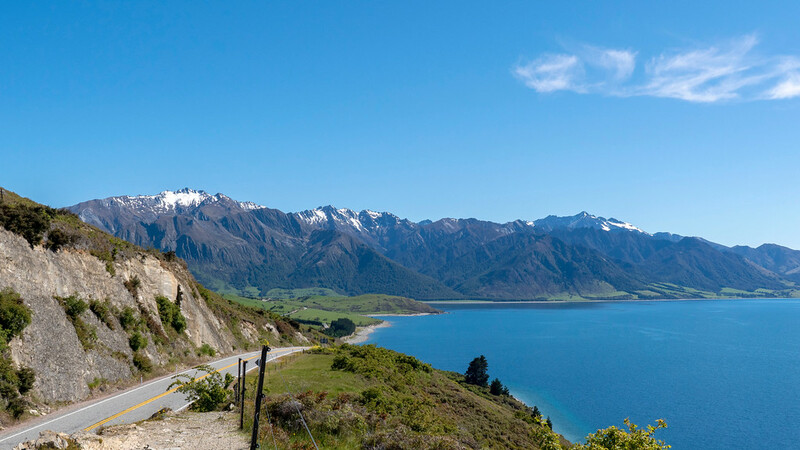 The scenery is stunning everywhere you look in New Zealand, and they’ve designed the roads so you can stop safely at scenic lookouts. Don’t just stop wherever you want. Your car could get hit or you could get run over. There will be lots of signs showing where you can park safely, and be sure to take advantage of these opportunities. The weather changes like crazy in New Zealand, so you never know what you might encounter from day to day. While the weather will be more dangerous in the winter, you can still have heavy raining or flash floods in the warmer times of year. While we didn’t personally experience much bad weather in November, we managed to dodge it. A week before we arrived in New Zealand, it rained so frequently and some roads were closed to traffic. About a week into our trip, we saw on the news that there were some freak snowstorms in Queenstown, followed by flooding. Many of the roads were closed again. If you don’t pay attention to the weather, you could find yourself in the middle of some terrible weather situations. You don’t want to have a car accident or become stranded somewhere. It’s always a good idea to research the weather each day before you head out to make sure you don’t drive into a storm. New Zealand is a pretty expensive country. 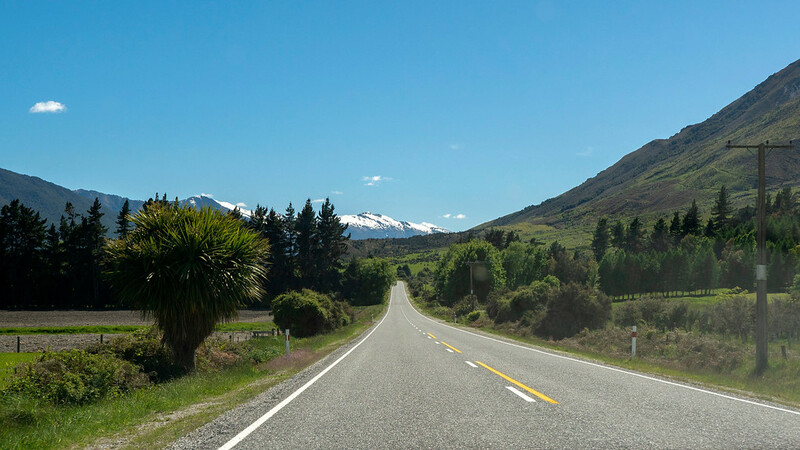 As for things you might need for your New Zealand road trip, you will likely be better off buying these items at home and bringing them with you. When you rent a car in New Zealand, you don’t want to waste your time shopping for items that you neglected to bring with you. In my opinion, you must rent a car in New Zealand to have complete freedom over your own itinerary and activities. 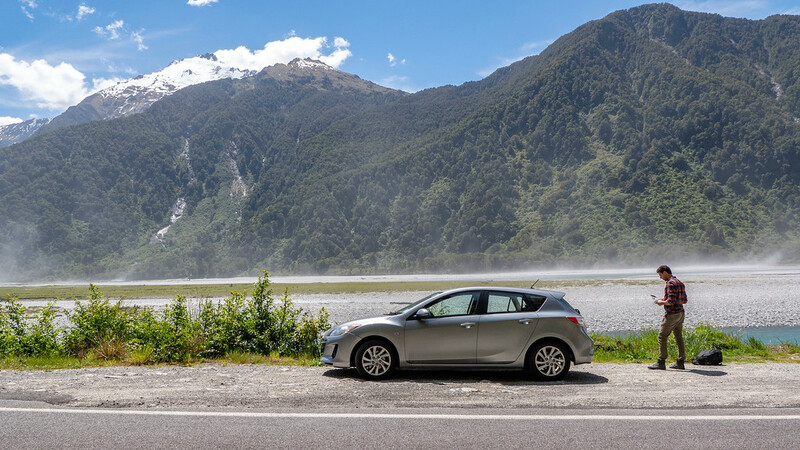 By choosing to rent a car in New Zealand, you can drive wherever and whenever you’d like, and organize the trip entirely on your own terms. It’s easier to escape the crowds by not traveling on a large tour bus, and you can visit new places that you discover on a whim. 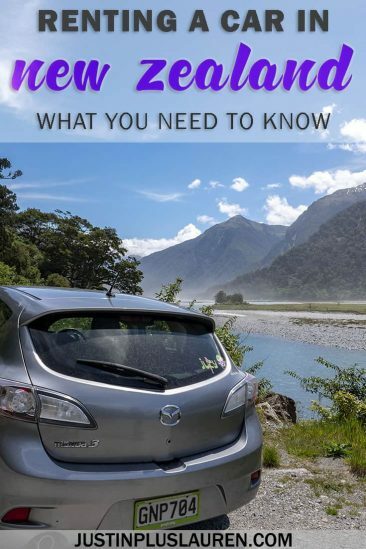 Once you arrange your New Zealand car rental, be sure to familiarize yourself with the rules of the road, which go beyond driving on the left. Use your common sense and stay safe out there. Don’t create any hazards or contribute to the crazy tourist stories out there when visitors act erratic or foolish. If you’re looking for more tips for traveling around New Zealand, check out this amazing guide about travel in New Zealand. PIN one of these images to Pinterest for future reference. Click the top left corner. 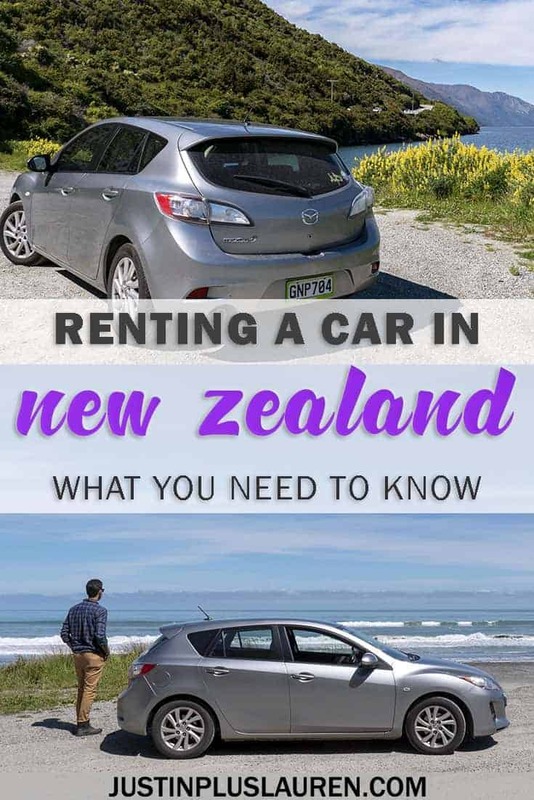 Have you ever rented a car in New Zealand? What’s your most valuable tip to remember? Check with your credit card company if you use a mileage card about the automatic Collision Damage Waiver insurance that is included with your card. If you purchase the CDW insurance offered by the car company, you may void the insurance coverage from your card which is otherwise primary. It may exclude windshield glass damage, so worth checking. I was told that you don’t need Liability Insurance coverage in New Zealand in case you hit someone or cause an accident, because lawsuits for road damages are not a sueable event. I am always more concerned about the lawsuit/personal injury side of an accident which could be much, much more expensive than damage to the car. Barbara, that’s great to know! Thank you for all of the valuable tips!